The US secretary of state has cut short a three-nation tour of Africa following a volcano eruption that has created an ash cloud over parts of East Africa. Hillary Clinton arrived in the Ethiopian capital on Monday for an address to the African Union. US officials said the decision was taken because the cloud was due to move towards Addis Ababa. The cloud, triggered by an eruption in Eritrea, has led to the cancellation of some flights to East Africa. The German airline Lufthansa cancelled flights to both Eritrea and neighbouring Ethiopia. Mrs Clinton had been due to leave for the US on Tuesday afternoon. But a senior US official told AFP news agency said she would leave on Monday "because the ash cloud is moving towards Addis and it could cover the city". Earlier on Monday, she addressed the 53-member African Union, urging them to call for Libya's leader Muammar Gaddafi to step down as he faces an uprising by rebels supported by Nato aircraft. "Your words and your actions could make the difference [in ending this situation]... and allowing the people of Libya to get to work writing a constitution and rebuilding their country," Reuters news agency quotes Mrs Clinton as saying in her speech. The US secretary of state then met Ethiopian Prime Minister Meles Zenawi, but cancelled a scheduled media briefing and held meetings with advisers to Sudanese President Omar al-Bashir as well as Salva Kiir, president of the soon-to-be independent South Sudan. The Nabro volcano, in the Southern Red Sea Region, erupted on Sunday, sending plumes of ash 13km (eight miles) into the air. "The plume from the volcano is covering the whole of Asmara since the morning, but now it is clearing somewhat," one resident was quoted as saying, Reuters reports. "If the cloud reaches Egypt, Israel or the Arab peninsula, the impact on air traffic will be more significant, but it is too early to know," AFP quotes Jean Nicolau of French weather service Meteo-France, which houses the Volcanic Ash Advisory Centre responsible for Africa, as saying. 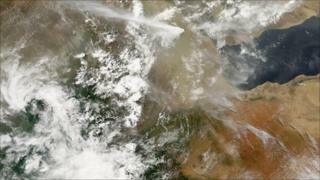 According to the Israel Meteorological Survey, the ash is expected to reach Saudi Arabia, Jordan and southern Israel. Saudi Arabia and Jordan were likely to be severely affected by the ash, it said. Peggy Hellweg, a seismologist at the University of California, said it was difficult to know if the volcano would cause more problems. "It could go on rumbling and spewing ash for quite some time or it could even blow up quite largely and cause much more trauma to our international interactions," she told the BBC's Network Africa programme.